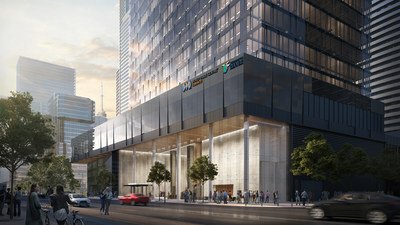 TORONTO, April 16, 2019 /CNW/ - The Toronto Region Board of Trade (the Board), in partnership with Menkes Developments Ltd. (Menkes), TD Greystone Asset Management and CBRE are pleased to announce that 100 Queens Quay East will be the new home of the Board and its rapidly growing trade services arm, the World Trade Centre Toronto (WTC-T). The historic move to a bigger space on the waterfront, after 45 years in the financial district, supports the Board and WTC-T's mission to be a catalyst for a vibrant, globally-competitive business community. The World Trade Centre Toronto will be an ecosystem of local, regional and international organizations under one roof - including the Board – who will work together to help Members compete and scale, and support inbound and outbound trade missions. By more than doubling the size of the Board's current footprint, the WTC-T will be well equipped to support the robust growth of lauded trade programs, fulfil expanded demand for premiere corporate event space, and deliver the strategic services of the Economic Blueprint Institute, the Board's new economic data and insights arm. "We believe in global connectivity. We believe in finding future-focused opportunities and ideas for our Members, partners and all levels of government. We believe in raising our collective voice," said Jan De Silva, President & CEO, Toronto Region Board of Trade. "We want our new, iconic trade, business and corporate event hub - in the energized, new waterfront business district with its thought leaders and innovators - to drive the Toronto region's momentum." The landmark 25-storey office building, which features approximately 690,000 square feet of Class "AAA" space, is the first phase of Menkes' vibrant, 4.6 million square foot mixed-use community on the waterfront called "Sugar Wharf". The Board is taking approximately 90,000 square feet in this landmark tower that will feature an enlarged, iconic corporate event space with an outdoor terrace overlooking the city, as well as an enhanced workspace for Board Members. CBRE Ltd acted as the sole brokerage advisor on the transaction. "Toronto Region Board of Trade's city-building mission and history of advocacy are continuing drivers of our City's success on the global stage," said Peter Menkes, President, Commercial/Industrial at Menkes. "We are humbled that Jan De Silva and her team share our vision for both 100 Queens Quay East and the emerging technology, arts and business ecosystems on the waterfront. This is truly a significant lease for the future growth of Toronto, and follows the recent news of WPP plc and MaRS Discovery District locating on the waterfront." This news follows an announcement made by the Board in 2017 that it would be relocating its offices from First Canadian Place and looking to secure space in a unique Toronto building. The move is scheduled to take place in 2022. Designed by B+H Architects, 100 Queens Quay East has been conceived with the objective of achieving the highest standards in environmental sustainability by striving for Leadership in Energy and Environmental Design (LEED) Platinum certification. "Toronto has the lowest downtown office vacancy rate in North America, which creates significant challenges for companies that are growing and innovating. In working with Menkes and the Toronto Region Board of Trade, we see creative real estate solutions come to life and add momentum to Toronto's newest innovation hub," said Cathy Bongard, Associate Vice President, CBRE. Organizations interested in joining the Board or World Trade Centre Toronto ecosystem can contact Brenda Gardiner at bgardiner@bot.com for more information. Positioning the Toronto Region as a global champion starts with your growth. The Toronto Region Board of Trade is one of the largest and most influential chambers of Commerce in North America. Our constant flow of ideas, people and introductions to city-builders and government officials firmly roots us as connectors for—and with—the business community. Backed by more than 13,500 members, we advocate on behalf of business for policy change to drive the growth and competitiveness of the Toronto region. We act as catalysts to make Toronto one of the most competitive and sought-after business regions in the world, which starts with the success of our members. Learn more at bot.com and follow us at @TorontoRBOT. The World Trade Centre Toronto (WTC-T) is the Board's trade services arm. As a member of the World Trade Centre Association, WTC-T creates unparalleled global access for the Toronto region's business community with its connection to 328 branded properties and trade services associations in 91 countries. WTC-T provides targeted international trade advisory services and expertise through comprehensive research, trade education, strategy building workshops, outbound and inbound trade missions and valuable connections to experts and networks. Learn more at wtctoronto.com and follow us at @WTC-TO. Menkes Developments Ltd. is an award-winning, fully integrated real estate company involved in the construction, ownership and management of office, industrial, retail and residential properties. Founded in 1954, the company is one of the largest private developers in Canada, with a primary focus in the Greater Toronto Area. Menkes is known for its innovative, multi-disciplinary approach and superior design, and is highly regarded as one of the most trusted builders in Toronto, with a strong reputation for quality and customer service excellence. Past projects include the Four Seasons Hotel & Residences in Bloor-Yorkville, 25 York Street (Telus Harbour), and the two million square foot Harbour Plaza/One York commercial retail complex. For more information about Menkes, please visit menkes.com and follow us @MenkesLife. CBRE Group, Inc. (NYSE:CBRE), a Fortune 500 and S&P 500 company headquartered in Los Angeles, is the world's largest commercial real estate services and investment firm (based on 2018 revenue). The company has more than 90,000 employees (excluding affiliates) and serves real estate investors and occupiers through more than 480 offices (excluding affiliates) worldwide. CBRE offers a broad range of integrated services, including facilities, transaction and project management; property management; investment management; appraisal and valuation; property leasing; strategic consulting; property sales; mortgage services and development services. In Canada, CBRE Limited employs 2,200 people in 22 locations from coast to coast. Please visit our website at www.cbre.ca and www.cbre.com.